Wyrd Sisters by Terry Pratchett. Book in good condition, all pages intact. 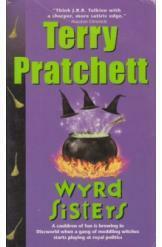 The cauldron is brewing fun in Discworld and a gang of meddling witches begins to play at royal politics.